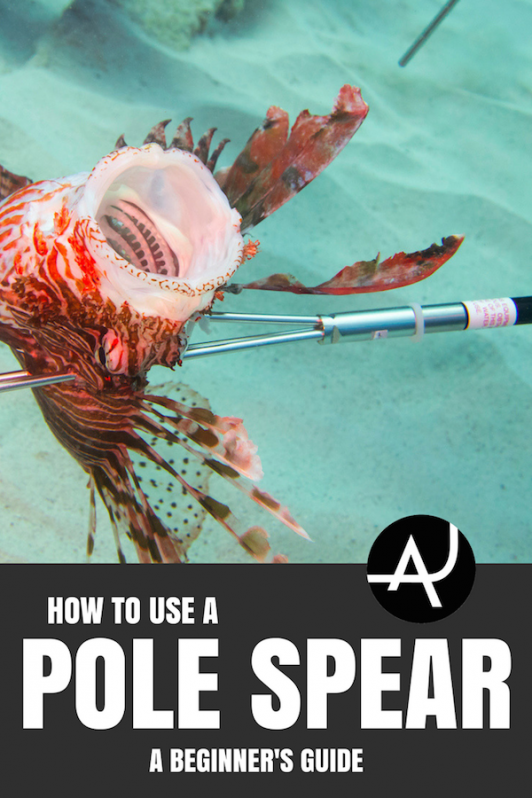 If you live anywhere there’s a spearfishing community, you’ve probably seen pole spears in sporting good stores. These long skinny shafts with sharp tips on the end look like something you’d use out of desperation to catch food with if you were stranded on a desert island. But if you know how to use a pole spear, it’s a deadly and versatile fishing tool. 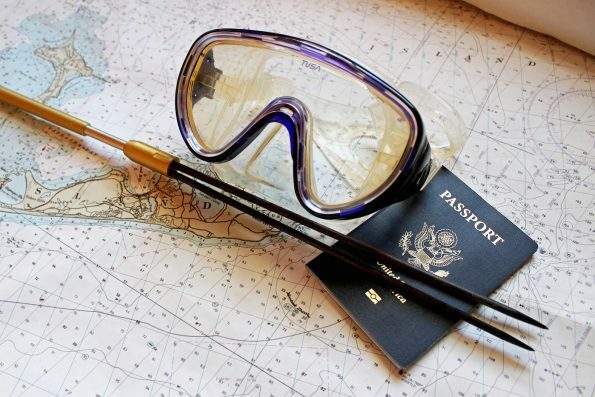 It’s also a great way to learn the art of spearfishing. Speargun users are accustomed to shooting from relatively far away. With pole spears, it’s up close and personal. If you’re ready to learn, this guide will teach you the fundamentals of how to use a pole spear. The first step in being successful with a pole spear is to buy the right one. There’s a wide range of variations in pole spears, but the main differences to worry about as a beginner are the tips, the length, and the material of your spear. As a beginner, you should only concern yourself with the three main lengths that spears come in–five, six, and seven feet. The length of the spear will affect how much range you have. 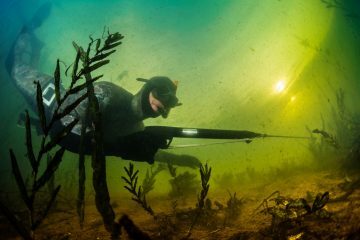 One of the biggest difficulties with pole spearfishing is the reduced range. Your shot will only travel the length of your spear. It may be tempting to go for a longer spear, but they can be tough to maneuver for a beginning spearo. Don’t worry though, even when you become an experienced fisherman, the shorter spears will still be useful. Especially when you want to go hunting in cramped spaces. Many deep sea spearos started in the shallows with a pole spear hunting reef fish. When you consider which length of spear to buy, consider the environment you’ll be hunting in. 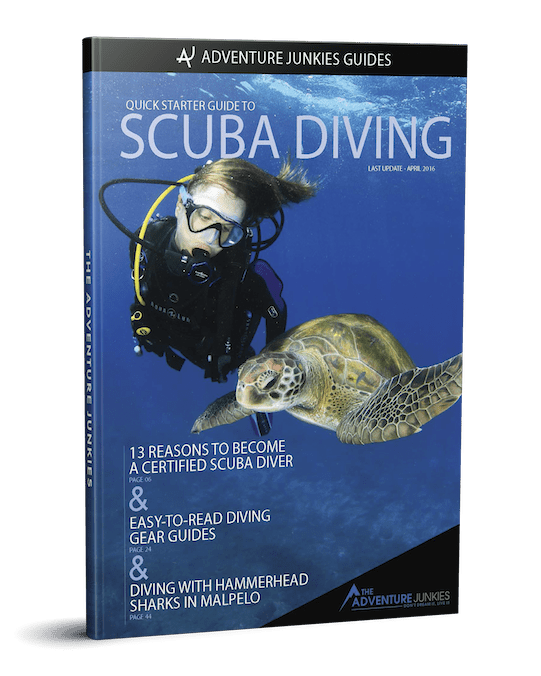 For example, if you’re going to hunt around reefs or jetties, where you’re likely to be in close quarters, go with a shorter spear. In more open water, you’re going to want a longer spear since it will be more difficult to get close to the fish. Like spear length, the spear tip you want also depends on your environment. The three types of tips are slip tips, three-prong (“paralyzers”), and flopper tips (a.k.a single or double barb tips). Slip tips need to be rigged to your spear with a thread because they actually detach from the spear when they stick in a fish. 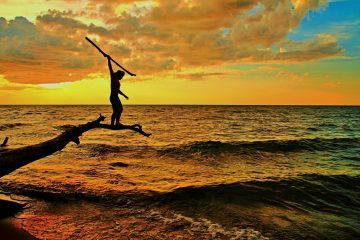 These tips are better suited for experienced spear fishers because if you miss and hit a rock or reef, the tip will be damaged. And slip tips are pricey. Three-prong tips are also known as “paralyzers.” The three prongs pack a punch and are meant to stun the fish, hence the name. But they don’t get as much penetration. They rely on the impact of the hit to stun a fish long enough for you to secure the kill. If you want to use a paralyzer tip you’ll have to get used to quickly securing the fish because they can wriggle off a three-prong fairly easily. They’re good for beginners as they don’t require as much precision. But you should only use these tips if you plan on hunting smaller fish. Flopper tips, especially single barb, require more precision but are better for the bigger fish that a three-prong tip can’t penetrate. These tips won’t sustain as much damage as a slip tip if you hit a rock or structure and they’re more affordable. The materials used to make pole spears are aluminum, carbon fiber, or fiberglass. The main difference in each of the three options is weight. The weight of the spear affects the speed and stopping power of your shot. The heavier material, like aluminum, travels through the water slower, but it provides more stopping power. Heavy spears also require heavy bands to propel them, which can tire your hand out. Carbon fiber is fast and provides plenty of stopping power for smaller fish. But you can also get a hybrid of aluminum and carbon fiber to get the benefits of both. Again, the material you want in your spear depends on the size and type of fish you’re hunting. Once you’re equipped with the right spear, the real fun begins. Don’t be discouraged if you don’t catch anything your first couple times out. 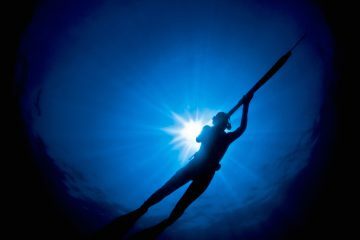 Spearfishing is hard, and learning how to use a pole spear increases that difficulty level. It’ll all be worth it when you stone your first fish. 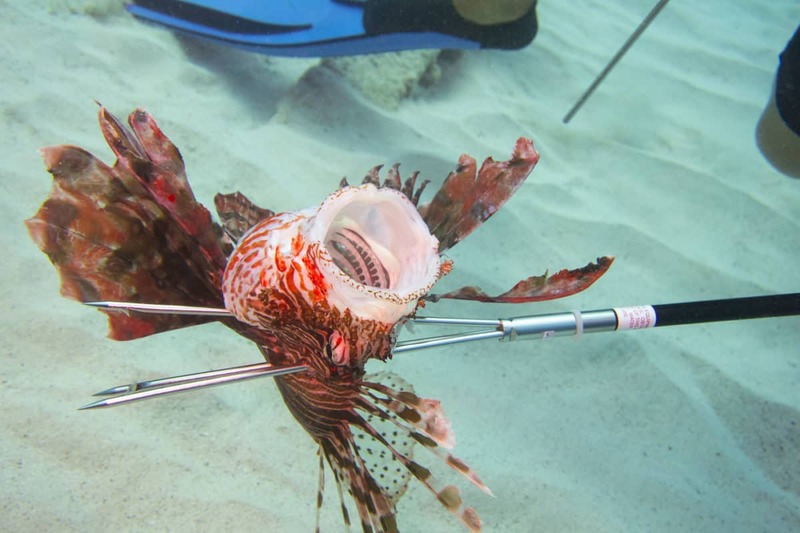 Spearfishing with a pole spear is tough because you have to get so close. Luckily, one of the benefits of pole spears is that they’re quick and easy to load. 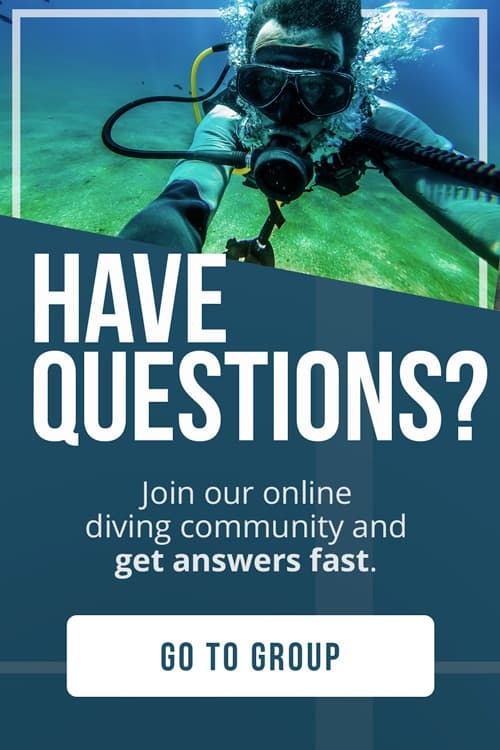 A pole spear also won’t affect your buoyancy as much as a gun. This allows you to prowl the water with a non-threatening body position. Observe you area, move slowly, and pick your spot. You need to get within about five feet to hit a fish consistently. It’s not easy, so use your environment. Camouflage yourself and hide behind rocks. Look at the fishes’ patterns and wait motionless in the corridors they swim down. To load your spear, loop the band through your hand using the space between your thumb and forefinger as an anchor. Then, with the same hand, reach up the shaft of the spear as far as you can. The further you reach, the more speed and stopping power you’ll get. But don’t drain your energy by holding your spear in firing position all the time. Many beginner spearos make the mistake of constantly holding their spear cocked and ready. This drains your energy and uses up oxygen. if you’re not confident in how quickly you can load, hold the spear semi-loaded with the band through your hand but not fully stretched. Always aim for a “stone” shot. Stoning a fish is spearo lingo for a kill shot. To stone a fish, you want to aim for the spine. Hitting the fish’s spine anywhere will reduce its ability to get away, but the ideal shot is at the base of the spine. That’s usually right behind the gill above the fish’s eye. Placing your shots well will reduce the chance that you just injure the fish and it swims off suffering. It’s a much more humane way to spearfish since there is no such thing as catch and release with a pole spear. You may be thinking once you’ve hit the fish the hard work is done. For the most part it is, but you’ll lose plenty of fish you thought you caught if you don’t secure your kill. If you don’t stone the fish it becomes a race against time to secure the kill. The best way to do that is to keep your arm straight and drive the spear through the fish and up towards the surface. This will secure the fish on your spear and give you an opportunity to secure it with your other hand. Then string it up and go home, or keep hunting.